As you know he was the sitting Councillor for the old Western Ward so there is sense in his offering continuity in the new Rodbourne Cheney half of his old Ward. Yes I agree it would have been an interesting contest but having spent the day writing up who is standing where there are some peculiar decisions by all the main stream parties. Look at the Liberals they are really struggling to make their presence felt this time. Is it because the Pajak family are not standing en masse this time? Mind you I think three of them is more than enough! the day must come, when you must live where you want to represent, this moving all around town and even living in malmesbury and then going for what !!! Is Oliver Donachie, the same Mr Donachie who came on to TS under his partner's name Emma Faramarzi, flamed everyone about the WIFI scheme, then got another ID (can't remember the name) and subsequently got banned for abusive behaviour? Probably DarkAuror but he is irrelevant as surely he doesn't stand a dogs chance anyway!! The Tories are probably aware of his ability to embarass and that is why he is standing here? That's him although, despite what he might say elsewhere, he's not banned. His posts were, and will forever remain (should he choose to return) deliberately delayed to hamper any recurrence of the abusive behaviour you mentioned above. Surely if they were, they would not allow him to stand anywhere for any reason. there is absolutely no logic to that. I guess that they are really desperate for candidates, especially paper candidates. Dolly has a pulse and is a 'businessman' and therefore fits the required profile. Being an 'entrepreneur' is no longer seen as being a prerequisite. Also possible that he's less of an arse in person than he is on the www. Despite not being a tenant himself, Oliver thought he would involve himself in the SBC Housing Transfer discussions happening in a facebook group set up to serve as an interface between SBC and its tenants. Martin Wicks No Wendy we have all the tenants who weighed in here and fought the Council on their home turf. Oliver Donachie ? *sigh* exactly how is the local government organising, deploying and collating an open and free vote so they can ensure the will of the tenants is acted on "fighting" anyone? I think that all the people involved, the tenants, council, facebook maintainer, the whole lot deserve a thank you. After all they could have printed a load of lies on a leaflet and gone and hid on a closed forum right? I welcome the transparency and character people have shown on this site, may it long continue. Martin Wicks Well thank you Oliver, I'm sure everybody is over the moon that you are happy. As for "lies" look at Page 7 of the offer document, the one which said that all sheltered accommodation would be upgraded in the first 10 years, whereas it would only the the "priority schemes". There were all manner of misrepresentations which I won't go into now. It's been a busy day. Oliver Donachie Martin, evasive as ever, the question was "exactly how is the local government organising, deploying and collating an open and free vote so they can ensure the will of the tenants is acted on "fighting" anyone? " Martin Wicks Just noticed this Oliver old boy. Why do you think tenants voted so overwhelmingly against Oliver? One of the reasons is because the Council produced biased one-sided information designed to lead tenants to draw the conclusion that they had no choice. Why do you think people on this site complained about the conduct of the council? Why do you think people complained about being harassed? Why do you think people complained agbout Council staff trying to persuade them to vote Yes when the staff were supposedly neutral? Council staff were set against tenants on the basis that their jobs were at risk if there was no transfer. I know this because some staff have told us. Your friends fought an undisclosed Yes campaign You lost it, overwhelmingly. Get over it. Let me explain your ironic, simplistic, bemusing but ultimately misguided outlook. You say the council did X Y and Z bad thing, that they acted badly, punched vicars and eat dolphins, which is fine, I am not going to discuss why truth is important in matters like this, let’s just say I accept you have the right to an opinion, no matter how misguided, but let me tell you something that is a matter of recorded, public fact (a recorded vote) taken in the council chamber. Labour did not want the tenants to have a vote on this matter. Nobody “won” or “lost” this, the problem exists because of years of disastrous Labour budgeting that has left Swindon repeatedly short in the deal, so the local council did the right democratic thing and gave the people affected the choice to decide how WE the people of Swindon will deal with the problem. My “friends” fought nothing but to have a democratic process around this matter that Labour would have denied the tenants. WE the people of Swindon won that vote. It may not have been to my personal satisfaction because I know the storm that is coming but again and for the last time, I am happy that council and others on this forum conducted itself so well. The only sense of “loss” I would have experienced is if somehow the few Labourites still in the council managed to scupper this process. Martin Wicks Oliver you're not very well briefed. Here's a few hints. Defend Council Housing, which was a group I helped to set up, opposed transfer in 2002 and 2009. You may remember that there was this Party called New Labour in office at the time. We opposed New Labour housing policy because it was based on Thatcher's policy. You seem to have confused me with a Labour Party member. I presume your earlier comment re "script from your pals" means that you think the Labour Party gives me their instructions. That's very funny. Anybody who knows me knows that I set my own script in conjunction with my colleagues in Swindon Tenants Campaign group. I am not a member of any political Party. Does the same apply to you? If you don't believe any of this that's up to you. Frankly I can live with it. The reason you came on here, of course, was to bolster the pro-transfer opinion. Fair enough. But in making statements about me waiting for a script from "my pals" you only make yourself look ridiculous since you are so badly informed. In fact all the people involved in organising the Swindon Tenants Campaign group are not members of any political party. All the leaflets we circulated were produced by and for tenants. We set our own agenda and we will we continue to build an independent tenants movement. Mike Matthews I always thought by some of your comments on here you worked for the council as well, must be just the way you come across on here being so informed Oliver. Mike Matthews But Oliver you may not work for the council but I would imagine your view over the housing vote would be very one sided.Is your wife not a Conservative councillor in Swindon Borough Council. This and the fact your are not a council house tenant. Sorry if I have my wires crossed and I dont mean to run any one down, but it would be nice to here open no political party lead views on here. I am a council house tenant from Penhill with no links any political party or council and my views are my own. Martin Wicks I'm not gloating Oliver. In fact when I heard Rob Buckland on the radio programme I was also on, speak about trying to get some reduction in the debt, I managed to speak to him and suggested that given the short timescale left he speak to the Minister directly. He agreed to try that. Incidentally, he said that he understood that STCG was liekly to be continuing and said he would be happy to work with us. So who invited you onto the Form then? I wouldn't dream of judging you by the fact that your partner is a Tory Councillor - that would be guilt by association - but perhaps for the benefit of transparency, so that everybody knows where you stand, you can tell us if your are a member of the Conservative Party. Oliver Donachie Heh, do you really think I answer to you? The answer is no, I have no idea who you are. But for the benefit of anyone else that may be interested. Oliver Donachie ?1: I am not a member of the conservative party, yes I would like to be one, I have in the past voted Labour / Conservative / Conservative / Conservative , I also enjoy romantic dining, long walks and horlicks. Oliver Donachie ?2: I have no idea who invited me, tell me where to look in facebook and I will tell you, I think it may have been Mrs Liggins? Oliver Donachie Now I have completed your exciting bonus question round Mr Wicks, as you have repeatedly show yourself to be wrong with your "facts" can you kindly retract whatever the point it is you are trying to make so the grown ups can continue talking? Oliver Donachie ?Mike Matthews, my freedom to talk on facebook did not end with my partner being a councillor. You may be suprised to know that two people can be in the same building but have similar/ the same / opposing views. My being interested in Conservatism, goats cheese or the Dali Lama has very little to do with anything, as I have said many times in this forum, I have two sisters and many nieces / nephews effected by this decision, so I decided to take an interest, do you have a problem with that? Mike Matthews No I dont think anyone has a problem with you taking an interest or your freedom to talk on facebook thats your right. Your right two people may have differing views in the same house but would you go and post it on facebook if your views were opposing. Just looked to me like a lot of pro transfer people on here were council staff or people with connections to the council in one way or another. Oliver Donachie OK, so in the interest of keeping this forum on track despite Mr Wicks agenda, lets just try to keep politics out of it where possible. 1. I think Oliver is standing in the wrong ward entirely, with his sneering attitude and dismissive air he should be standing with Rod Bluh in Old Town. 3. I notice that Oliver has now removed the libelous statements he'd made about me from his blog and Cllr Holland has similarly deleted a fair amount of stuff from his facebook. I didn't ask either of them to do this, I was content for both of them to continuing publicising their real natures. I have copies. To Cllr Faramarzi's credit, she refused to follow her boyfriend to Russell's 'let's gang-bang the vile gentleman' party, saying: "I'm not getting involved in this". Getting that comment recorded proves she was still thinking while others present were busily giving each other a political reach-around. Sensible girl, Olly should listen to her. "Oliver Donachie ?1: I am not a member of the conservative party, yes I would like to be one, I have in the past voted Labour / Conservative / Conservative / Conservative , I also enjoy romantic dining, long walks and horlicks." That's an interesting one, does the Conservative Party allow non members to stand then? either that or he joined very quickly. 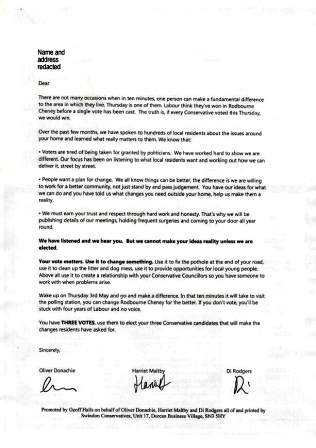 Conservative 'pledge' letter distributed to electors in the Rodbourne Cheney ward. ['Pledge Letters' are letters which are sent to voters by political parties because the party believe the voter is likely to voter for their candidate]. I believe Olive has worked hard to convince Rodbourne voters that he's not the same geezer that appeared on TS. Page created in 1.146 seconds with 26 queries.